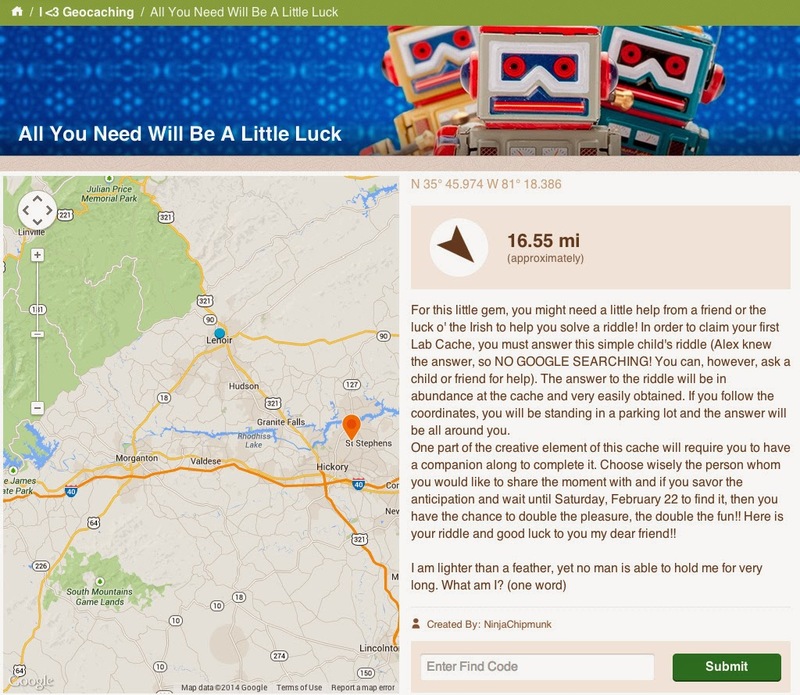 On Sunday I headed over to Lincoln County NC to do some geocaching. While I was there I ran across the South Fork Rail Trail, which is a member of the Carolina Thread Trails project. At just 0.8 miles this is a very short, but well groomed trail. It runs along the southern fork of the Catawba river, so it has some beautiful scenery. It is also home to two geocaches, which is what brought me here in the first place. The main feature of the trail is this amazing waterfall, which looks main made. I believe there is an old mill across the river from here. It is a short and easy trail, but I enjoyed it. If you get a chance, I recommend getting out of the house and exploring this, or any of the other thread trails in North and South Carolina. You never know what interesting gems you'll discover. This is a Groundspeak lab cache. 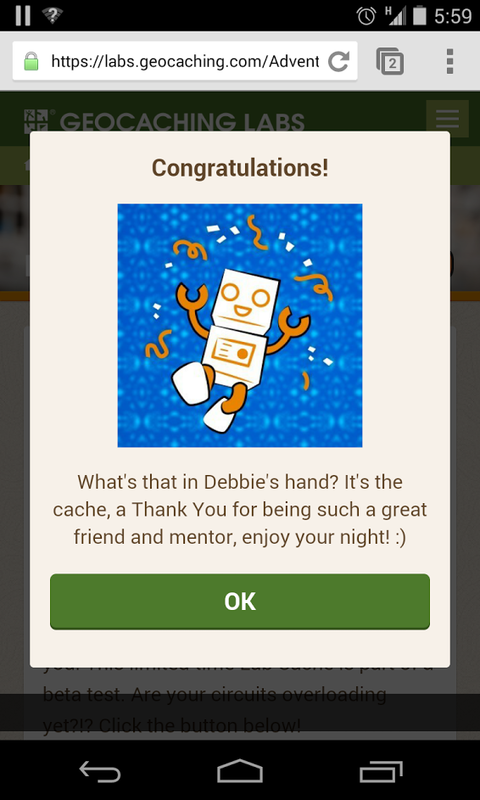 In an effort to play around with different geocache ideas, in the month of February any premium member of geocaching.com was allowed to create one cache, and one person could find it. The cache could take any form, without the restrictions of the normal geocaching guidelines - the world is the geocache hiders oyster. They call it I <3 Geocaching (the 'lab cache' comes from the experimentation part). The caches are logged by entering a code that is determined by finding a container, or as in this case, solving a puzzle. I had arranged to swap lab caches with a local cacher who goes by the name of NinjaChipmunk. I had created a cache for her (a puzzle involving exploring a parking lot - yeah, I'm *full* of awesomely mediocre ideas). She in turn created a lab cache for me. It was at this point I started to suspect collusion with my dearest wife. You see she had informed me a week ago that she was going to take me out for dinner in Hickory on Saturday (she never does this - she often suggests we go out, but she never plans it ahead of time), and she had casually mentioned she wouldn't mind if I found a geocache on the way (I talked about filling in my geocache calendar so it didn't seem odd at the time). So when the cache said "bring a companion" on our already planned date night, in the same town 35 minutes away we already planned to go... my spidey senses were tingling... something was afoot. I didn't know what tho. It turned out to be awesome. I look up from my phone to see my wife holding an envelope in her hand. It turns out NinjaChipmunk gave us a gift certificate to an Irish Pub (which was in the plaza we were parked at - convenient!). So we went inside, and had a cracking good date - helped in part to a lab cache. Ninja said she wanted us to have a good time, so we ordered drinks ('tis date night after all). I was faced with a plethora of tasty looking scottish and irish beers, so I decided to get a sample platter of 4 different beers. So many thanks to NinjaChipmunk for a great night, and a super awesome lab cache. This one is for you. Sounds like fun! When do we leave? After this weeks snow storm passed, I went out for a ride to see what biking in 6" of wet snow is like. I had biked to work during the previous snow fall with great results. This time we had twice the snow, and the temps were warmer so ice was more of a factor. Still, it was a rare chance to experience this sort of riding. Turns out ice was not much of an issue, but slush was. Under the snow was a half inch of slush. When I was riding in untouched snow this was not a problem (tho the snow itself was hard to push through), however when I was riding in tire tracks (or on the plowed roads), the tires would randomly break through the slush and make things unstable. Here are some scenes, starting with the view of the main ride through town. I looped back down the Greenway, which is paved under all that white stuff. Someone had, apparently, gone cross-country skiing the night before. Snow buildup on the tires was more of an issue this time around. The requisite mug shot to prove it was me on this ride. Took a picture of the bike on the bridge to match a similar one from last time, so you can compare the differences in snow coverage. Someone drove a 4-wheeler on the Greenway, which is illegal. However he went out in the snow, so despite being a monumental jerk, he is at least an adventurous one. The packed slush from the tires made riding on this part of the Greenway a lot harder than it needed to be. One last look at the slush covered roads. I am actually quite convinced that plowing, at least without sanding and salting, actually made them much worse, at least in the short term (plowed roads do melt faster, but thats a delayed benefit from this rides perspective). So that was my ride. 6" of heavy wet snow with a slushy base is likely my limit for snow riding. It was a great experience tho. I am glad I did it, tho I am also glad that I made it back home to eat second breakfast, cause man was it exhausting. As Canadians living in the southern United States, we tend to end up missing snow in winter, especially the fun that it can bring. Since Mother Nature decided to bless us with 6 inches of the fluffy white stuff on Wednesday, we got the chance to play in the snow on Thursday. More importantly, at least for me, our kids got the chance to play in the snow. It is a rare event to get enough snow to actually do snow things like build snowmen, and go sledding. It will likely only last a day or two, so I was itching to get out and make the most of it. So come along and join us as we experience the joy of a winter wonderland thru the eyes of my kids. We'll start by the classic snowman construction. This snow was excellent packing snow, so it only took a few rolls to get a large snowball to use as the base. Abigail was too little to push snowballs, but she spent a long time picking up snow and squeezing it between her mittens. Also, if you notice the snow goes up to her knees... explains those stories your Grandpa used to tell about walking to school with snow up to your knees, uphill both ways, eh? Building the second layer. I went inside to get carrots and some dark chocolate to use as the eyes. Oh, and the hat. Abigail went to play in her playhouse. All the kids at play, with a snowy guardian to watch them. Soon we headed off to the hill beside our house to try our hand at sledding. This was the first time either had really used a sled before. They took right to it. Zeke really loved it. Luckily for us he also enjoyed pulling the sled back up the hill, most of the time. Abigail enjoyed herself too, tho she was a little unsure of all the wicked speeds. Sometimes I pulled them back up the hill on the sled. Sometimes the sled tipped over by accident. This time I think Zeke tipped over on purpose. Sometimes falling off the sled is more fun than staying on it. So that was our day. It looks like the snow may still be around tomorrow so hopefully we'll get more adventures. You have to pack in as much fun as you can when your winter wonderlands only last 2 days. So the following are some pictures of the storm in action, and how my house looked during and after most of the snow fell. First some pics, starting with my house. A rough idea of how much snow fell between noon and 8pm(-ish). Clearly something to be feared. Looks like the birds will still have something to eat. The road was plowed before I got up at 7:30. Impressive for a town with one snowplow. And now, the moment you have all been waiting for. This is 36 hours of a 'catastrophic' southern US snow storm. The computer the camera was attached to went to sleep at midnight, so I lost some early morning footage, but I think you get the rough idea. I have been under the weather for the past week. I am not at 100% yet but today I was anxious to get out of the house and go on an adventure. The place I selected was on the Carolina Thread Trail at Murrays Mill in North Carolina. The Carolina Thread Trails are a series of trails that run across 15 counties in North and South Carolina. Typically these trails are interesting, and relatively easy, so it seemed like a great place to get in a hike, and do some geocaching. The day broke down into two parts. First was a leisurely stroll along Balls Creek along the Thread Trail. The trail also skirts along some privately owned corn fields. The stroll was very pleasant, which was good because I completely failed on finding the cache. After a 30 minute search I called it quits on the cache. The trail itself was worth the walk tho. The second cache was across the road from the mill. The trails connect, but the trail is not a part of the Thread Trail system. This was evident as the trail quickly faded into the underbrush, and I spent the last 500ft guessing at where the trail was. The cache was near a small falls along Balls Creek. My GPSr was bouncing everywhere, and previous logs indicated that the coords were off by up to 65ft. So I resorted to depending on clues in the logs and the hint, and using my geosense. It was a tough grind, but I stuck in using nothing but raw determination to not go home empty handed. It took me 65 minutes, but I eventually found the cache. Relieved I signed my name to the log, and headed back to the van. So it was a good day. Along the way I saw some interesting sights, starting with Murrays Mill itself. At the mill were also some old homesteads. Some looked like fairly new but abandoned houses, others, like this one, looked much older. One interesting piece of history was that the cornfield I was walking along was the same cornfield that Junior Johnson, famous NASCAR driver from the 50s, used to get his corn that he used to make moonshine. Now I am not a NASCAR fan in the slightest, but Junior Johnson was also a bootlegger, which means part of his story was the inspiration for the Dukes Of Hazzard, something every boy child of the 70s and 80s cares about. Moonshine and Bootlegging - oh yeah, baby. Near the falls at Balls Creek I saw something I had never seen before. So, you know how when some trees fall their roots bring up a lot of dirt with them? (sure you do!). I have seen this hundreds of times - 5 times today in fact. What I have never seen is two trees that fell in opposite directions from the same spot, in exactly opposite directions. Thats what this picture shows. I can't even imagine the mechanics of how this formation came to be. It is truly a wonder of nature. Another wonder of nature is this carpet of greenery over the leaf littered forrest floor. It was a lot of green for still being early February. So that ends my little adventure. Really, not a bad way to spend a Sunday afternoon. This is the fourth installment of my creative cache series. All of these caches have been spotted in the wild during my various cache hunts. I post them in hopes to inspire others to hide quality caches of their own, instead of tossing pill bottles under lamp skirts. First off is this old apple, found in an apple tree. The apple was made of foam. A simple birdhouse hide. The owl makes it art. An electrical box attached to a pole. This cache was out in the open. The combination is one of the numbers on the pole. Ye olde fake brick. This took me a long time to find since the bricks were behind some bushes, so they were not easy to see. Go forth and create. Make the geocaching world a more interesting place.